Cody Walker, who had previously worked as a movie stuntman in the past, resides in Oregon, although he has been in Los Angeles since his brother’s death to help comfort his mother Cheryl. 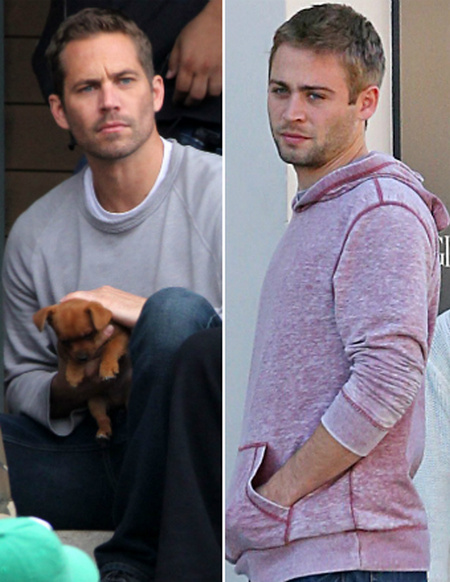 Fast & Furious star Paul Walker's younger brother, Cody Walker, 25, who looks almost like Paul, is expected to fill in for the late actor in the seventh edition of the movie. Cody has previously worked as a movie stuntman. The makers of the runaway hit franchise, who held a series of meetings after Paul's death, reportedly realised that they needed someone who looked like Paul to finish the movie and they approached his nearly identical brother, Cody, a source close to the production stated. "If Cody agrees it's because he wants to honour his brother's memory. There are many details that still need to be worked out, but right now the family and cast and crew are all still grieving," the source added. "They can shoot Cody from behind and at distance. If it's a shot they need Paul's face in close up, they can CGI it later on," a source close to the family is quoted as saying. The writers are also said to be looking for a way out for character Brian O'Conner in the $150m film, the production of which has been suspended till January. Screenwriter Chris Morgan is working on a new script around the scenes Walker had filmed. There has been mixed reaction from Paul's fans over the reported move to rope in his brother. "I can't believe the F&F producers want Paul Walker's brother to finish his part in the film! He doesn't even look like him!#nothappy,"one fan @Kelle_FLL tweeted. "so Paul Walker's brother was asked to shoot the rest of the movie ? I mean cool, they do look alike," @NatalieSivan tweeted. "The producer's of Fast & Furious might have Paul Walker's brother stand in for him to finish filming. NO THAT'S NOT OKAY,"@kkayla_519 tweeted. The developments come on the eve of Paul's burial at a small private ceremony to which only the family and the cast of Fast & Furious will be invited. "The family intends on dividing Paul's ashes between an urn and keepsakes," a source told Radar Online.